Having proper cushioning in a wheelchair is not only essential to comfort, but also for the overall health of the individual using a wheelchair. Many basic wheelchairs lack necessary cushioning to provide comfort and support. If you are a caregiver to someone or your loved one uses a bariatric wheelchair, a seat cushion is a “must have.” Don’t think of it as an extra accessory but rather a necessary feature. With dozens of wheelchair cushions on the market, it can be tough to decide which one will benefit your loved one the most. 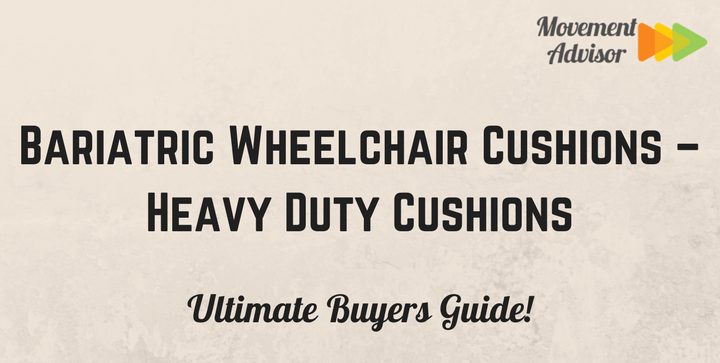 We will give you some helpful tips to selecting the right heavy duty wheelchair cushion, before you purchase the first one you find, and will share some of our top picks. If you don’t rely on the use of a wheelchair, you probably don’t know how uncomfortable they can be to sit in for longer periods of time. Many bariatric chairs (also known as extra wide or heavy duty wheelchairs) have a convenient fold-up design. This design means that the seat needs to be flexible, which can result in discomfort and lack of support. Without proper cushioning or support, an individual with mobility issues is prone to pressure sores, even more so if he or she is overweight. People who use a wheelchair are most likely to get pressure sores on the thighs and tailbone. These sores occur when bones (such as the tailbone) press against muscle tissue and over long periods of not movement or repositioning, the skin begins to break down. While no one should spend the whole day in a wheelchair, a bariatric wheelchair cushion will decrease the chances of a pressure sore from occurring. Some bariatric cushions are designed to have a larger weight capacity than others. Can’t find one with the proper weight capacity, right away? Avoid buying one that has a lower capacity. While it may feel comfortable at first, it may fall apart more quickly and not offer proper support, which can result in the issues we mentioned earlier. Bariatric wheelchair cushions not only have different weight capacities, but they are different sizes, too. Buying a cushion that’s too big or too small can result in improper weight distribution, discomfort, and inadequate support. You wouldn’t settle for an ill-fitting couch cushion, would you? To get accurate dimensions, measure the wheelchair from side to side, focusing on the outside edge of the seat upholstery to the outside edge of seat upholstery on the opposite side. This is your seat width. For seat depth, measure front to back along the side rail. Another thing to consider is the individual’s positioning needs. If he or she can get in and out of a wheelchair with relative ease and without too much assistance, a flat cushion may be sufficient. If he or she needs help positioning or cannot get out of the wheelchair unassisted, it’s better to look at contoured cushions that help maintain posture and positions. A cushion made of gel contains a water-based “gel bladder” and relieves pressure on the the tailbone, thighs, and buttocks by allowing the bony parts “float.” A gel cushion may have the layer on top of a foam base to promote temperature control in the body, prevent overheating, and reducing skin issues related to excess moisture from sweat. In some gel cushions, the gel layer is between layers of foam. This placement helps to redistribute the pressure and evenly distribute weight. Gel cushions typically have a weight capacity of 500 pounds. Memory foam, or a high resilient foam, is a popular material used for wheelchair cushions. This type of foam has a lot of open cells (bubbles) that are tightly packed together. Memory foam is comfortable and popular because it conforms to the body and offers adequate support, eliminating stress on pressure points. A memory foam wheelchair cushion may also have gel inserts for added comfort. High resilient foam cushions usually have a weight capacity of 750 pounds. Much like a gel cushion, a bariatric air cushion allows bony parts of the body to “float” and reduce pressure sores. Some air inflated cushions have multiple layers that help to redistribute the weight. Many air inflated wheelchair cushions have a weight capacity of 700 pounds. A wheelchair cushion needs to be easy to clean. From incontinence issues and sweat to food and drink spills, a wheelchair cushion should come with a cover that can be easily removed and cleaned. Some covers are waterproof while others are made of a breathable fabric. A cushion cover also helps to maintain the proper function of the wheelchair cushion. Another thing to consider is how the cushion is secured to the chair. Does it attach with a clip or does it just sit in the chair like a pillow, unattached? Look for non-skid features on the base or ties or clips for extra security and comfort. You don’t want to purchase a cushion, only to have it slide around and be uncomfortable. Even if you get the measurements right, the individual who uses the wheelchair cushion may not like it or finds it uncomfortable. Before purchasing a cushion, check out the return policy as well as any warranties. Since wheelchair cushions are often considered to be “medical equipment” you may not be able to return the cushion. If you find a cushion on sale, make sure that the model isn’t becoming discontinued just in case you need to return it for any reason (or that you like it so much you want more than one). PREMIUM QUALITY: Made from premium material designed to hold the cushions shape for a lifetime. 100% therapeutic grade memory foam, which molds to each individual body type, built for comfort, support and durability. Non-slip rubber bottom provides support on most hard surfaces and is a great for truck drivers, frequent travelers, office workers and pregnancy. Dimensions: 18.9X17.3X3.1". SUPPORT AND COMFORT: U-shaped cut out reduces pressure on the coccyx and tailbone promoting healthy posture and blood circulation. Enjoy painless sitting for long periods of time. HEALTH BENEFITS: Firm therapeutic materials provide pain relief from sciatica, herniated discs, tailbone injuries, pregnancy back pain, hip pain, hemorrhoids and other spinal issues. Avoid pain medication and doctor visits with the support this cushion offers. MACHINE WASHABLE: Washable velour cushion cover allows you to keep your cushion fresh and clean. Simply remove cover and place in washing machine to have your cushion looking new. DR. RECOMMENDED: Ideal for pregnant mothers, sciatica, gastric reflux, congestion, fibromyalgia, and carpal tunnel syndrome. 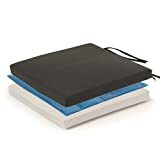 This bariatric wheelchair memory foam cushion as a contoured design to support and offer pain relief from sciatica, tailbone pain, hip pain, spinal issues, and other health issues. A U-shaped cutout reduces pressure on the tailbone, reducing pressure sores and poor posture. Not only can it be used in a wheelchair, but it can be used in the car or other types of seats to offer extra comfort and support when not sitting in a wheelchair. The non-slip rubber bottom provides extra security, and the velour cushion cover is machine washable. The dimensions of the foam cushion are 18.9” x 17.3” x 3.1” and the weight capacity is 500 pounds. Protekt Bariatric Gel Wheelchair Cushion with Straps - 22" x 18" x 4"
Protekt Bariatric Gel Cushion helps in the prevention of pressure sores and is ideal for wheelchairs. Ultra high density top foam layer. Stretch cover is breathable and comfortable. (2) security ties for added safety. * Please Note: For hygienic purposes, this product is non-returnable. 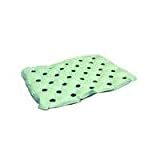 EH240WCIEA - Waffle Bariatric Cushion, 22 X 28 X 2, 700 lbs. This unique bariatric cushion diamond-shaped pattern design allows for the individual’s weight to be evenly distributed and reduce stress from sitting for prolonged periods of time. This wheelchair cushion is filled with air and supports up to 700 pounds. While other bariatric cushions on the market come with a cover, this one does not. The cushion is waterproof and easy to clean, but for extra comfort, you would want a cover of some kind. The dimensions of the cushion are 22” x 28” x 2”.